Create your own "granite" slab with this fun, simple and messy video tutorial. Hope you enjoy! There's an old saying which goes something like this, "Whether you say you can or you can't, you're right". Basically this means it's up to you to make it work. Or not. Lately I've been watching a lot of artists out there in the world whose work I wouldn't call "finished". They are selling their work. Prolifically. And for good money. How? I'm convinced it lies in having confidence in yourself. So why not have a go yourself? Post some work on Facebook - see what happens! More than just cheap tricks. We've been having fun writing and experimenting with faux finishes this month. Check out our new page. Our first truly global event is happening in April! To be a part of this, make sure you register your interest now. 2014 is shaping up to be an exceptionally busy year for workshops, locally & overseas. What happens when we no longer want our own art in front of our eyeballs? This is a great blog/forum for some ideas about what to do when your taste changes. Some great ideas for art you no longer like. This article came up whilst googling "how to be accepted as an artist". I was thinking more on a societal level when I entered the search, however this resulted in a happy accident which is totally relevant when thinking about whether to take the next steps as an artist. That is, do you want people other than your friends and family to comment on your work? If you answered yes click here. This month's post comes from talented artist, truly witty blogger and former lavender farmer, Brenda. "This is an interesting little acrylic study. Should have been a quick study but due to my pedantic nature and my pointless but unstoppable quest for perfection it is proving to be quite problematic. Current struggle: I thought the sheep would be simple to portray as they are in shadow, but working from my photograph, here is where I begin to realize the limitations of doing this even if the photo is my own. At first glance they appear “cool”. On closer inspection I discover the warm undertones of yellow, pink, lavender....I try to blend the hues I perceive, but the acrylic paint, even with retarder, makes this a nightmare for me. On top of this I have to think ahead and realize that what I am initially applying will change to something darker once it is dry. Okay at this point, I subconsciously scream, “give me my oils!!! !”, then take a step back and rationalize that this is a learning exercise, a problem solving exercise, as all paintings should be if one is serious about improving. I am shackled by my perfectionist nature....nothing I do is ever “perfect” enough, ergo it is a pointless struggle....and yet it is an unattainable goal which I relentlessly pursue! I am not a drawer, therefore the method of tonal impressionism/realism suits me more than any other approach. Having said that, I need to describe the shape of the sheep as truthfully as I can (the sheep cannot look like cows) and I can see the drawing is not as it is in the photo. I now resort to eye measurement, length of line comparison, negative shapes...all these tools come into play. As I am refining these shapes, I take a break every now and then to halt my “sheep focus” and throw in a few leaves and tree branches as loosely as I can just to unwind from the discipline of my focal point. I play....sketch in the gate, then remove it...too much, too fussy, unnecessary. I remember it is as important to leave “stuff” out as it is to include it. Just because it is there does not make it’s inclusion beneficial to the painting. I satisfy myself by throwing in a vertical or two and a few logs to break up the scene. 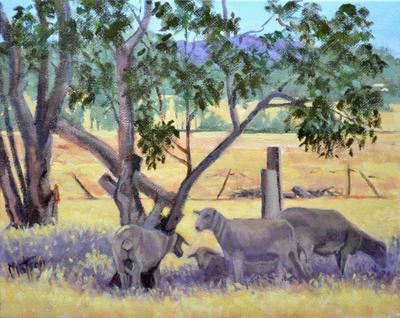 I rack my brain, have a “light bulb” moment and try a new tack with the acrylics and my sheep. I begin to apply glaze upon glaze, first Yellow Ochre (opaque earth pigment), with a bit of Titanium White but thinned down dramatically with acrylic matte medium – this instantly warms the subject....yes I am on the right track now. I wait just a few minutes for this to dry then apply the next glaze of red (Alizarin Crimson-cool red) biased lavender (combo of Alizarin Crimson & Cerulean Blue – both cool colours). Once that dries, I apply an overall glaze of Cerulean Blue. As I take a step back and view the sheep with new eyes, I am excited! I can see this will work to my satisfaction. 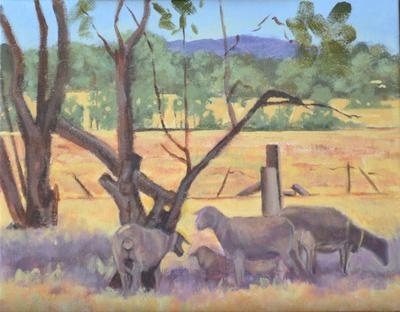 The sheep are visually blending yet still remaining colourful and vibrant. Rarely does “black” make an appearance on my palette (I prefer to mix my own darks, usually Ultramarine Blue & Burnt Sienna) but in this instance I went with my gut.....mixed Black with Cadmium Yellow and greyed off with a little Alizarin Crimson....just what I needed. Okay, that’s it....FINISHED! Hope you like it!" Thanks so much Brenda for sharing your work, and especially your journey.